When you live in a house with a small footprint, every square inch is valuable real estate. As my sewing skills improved and the number of sewing projects increased, no longer was it an option to take over the dining room table. So Mama went on the hunt for a proper sewing cabinet and I found one for a great price. There was only one problem, this Mid-Century Modern Sewing Cabinet had a chunk of trim missing on one of the doors. 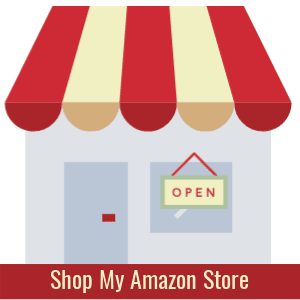 I should mention that sewing cabinets, unlike sewing tables, are hard to find and if you're lucky enough to spot one, they cost an arm and a leg. So I wasn't going to let a piece of missing trim scare me away from buying this one. Why? 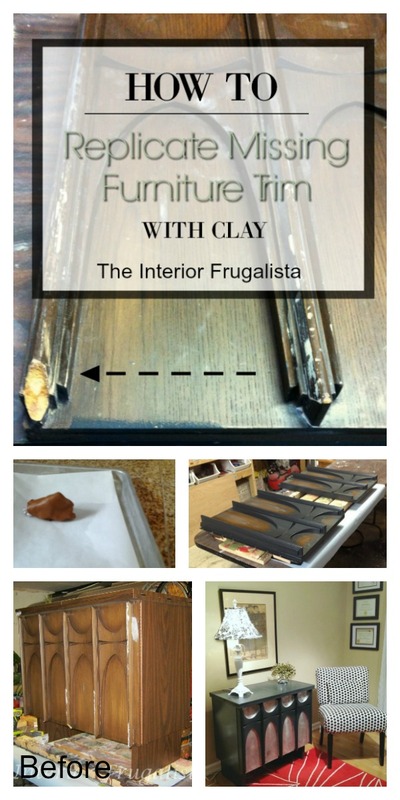 Because I knew I could replicate the missing trim with clay and I'm going to show you how. Now, some of you may be wondering if it's a vintage Broyhill Brasilia. While it certainly looks like it, I could not find any furniture maker's mark. 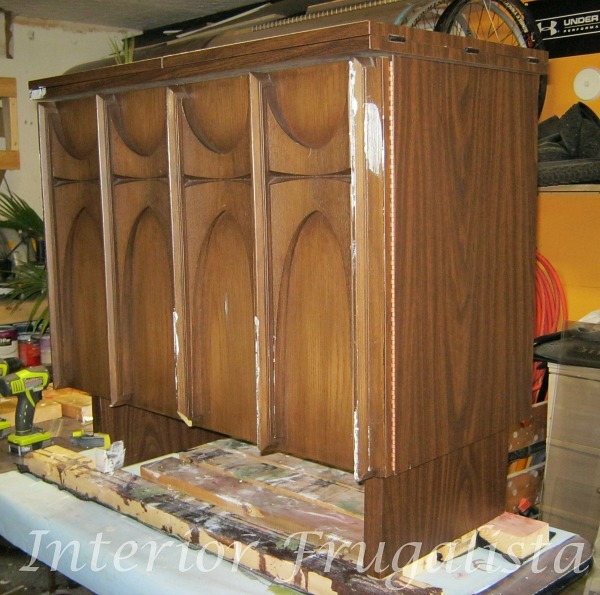 After doing some searching online, nor could I find any history of Broyhill making sewing cabinets. With the missing trim and peeling laminate, I felt guilt free taking a paint brush to it. Now let's get to the task of fixing it. 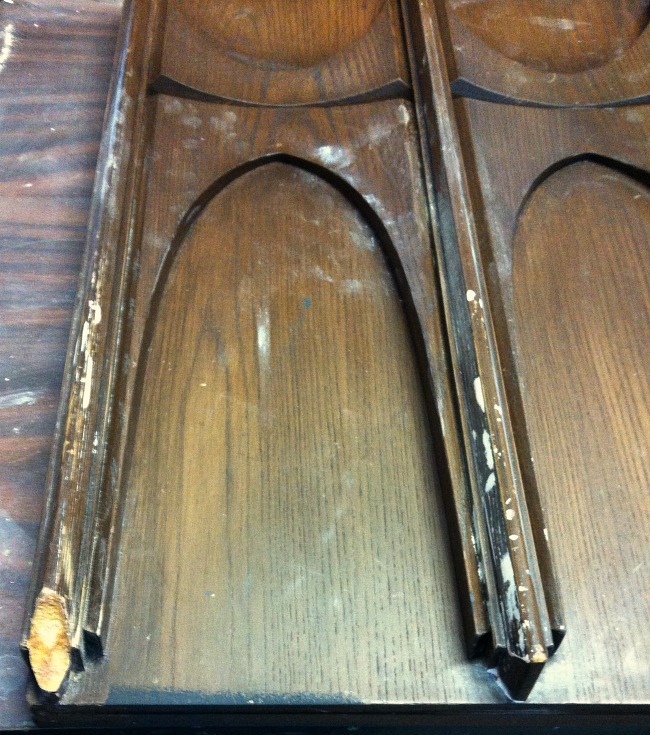 First, we need to make a cast from the undamaged trim on the opposite door using Sculpey polymer baking clay. Make sure you get a good impression of the entire area you need to replace. Carefully stuff the cavity with foil so it won't flatten during the baking process (as pictured above). Bake the cast (following package directions) at 275°F for 30-minutes. Let cool completely before moving on to the next step. 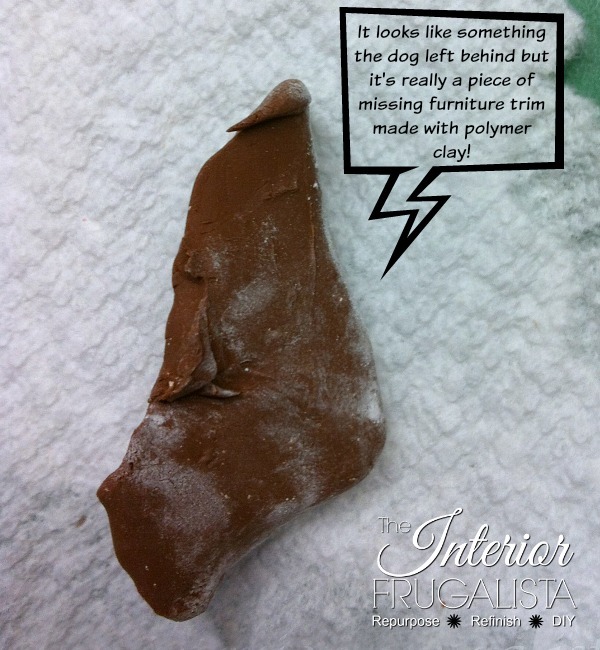 Tip: The clay comes in different colors so find one that matches the furniture you are repairing. 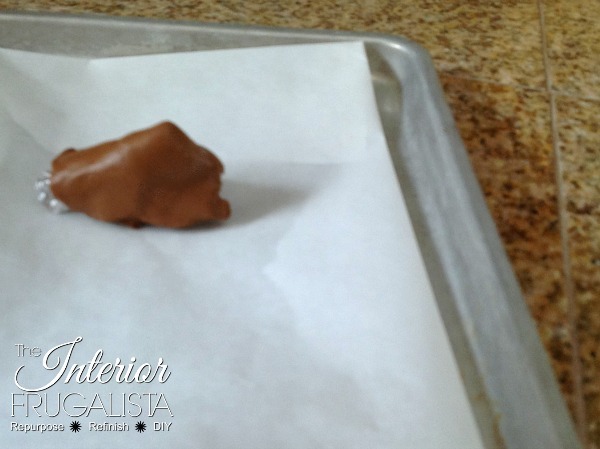 Once cooled, remove the foil and sprinkle the cavity with either cornstarch or baby powder (this will prevent the clay from sticking to the mold). Fill the mold completely with baking clay and check that there are no empty voids. Bake at 275°F for 30-minutes. 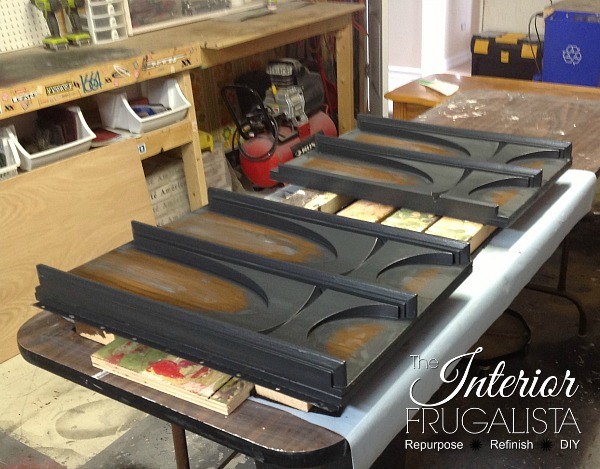 Let cool until it's safe to touch and remove the new trim from the mold. You can see in the picture below that it's far from perfect. No worries, we'll fix that up in the next step. Remove any extra dollops of clay with an Exacto knife. Smooth any ridges with sandpaper. Hold the trim up to the cabinet and note where it makes contact. Working in small sections, carve the trim with sandpaper in those spots and repeat until you have a tight fit. Don't be alarmed if it isn't perfect, any small gaps will be filled later. Once you're happy with the fit, wipe off any dust. 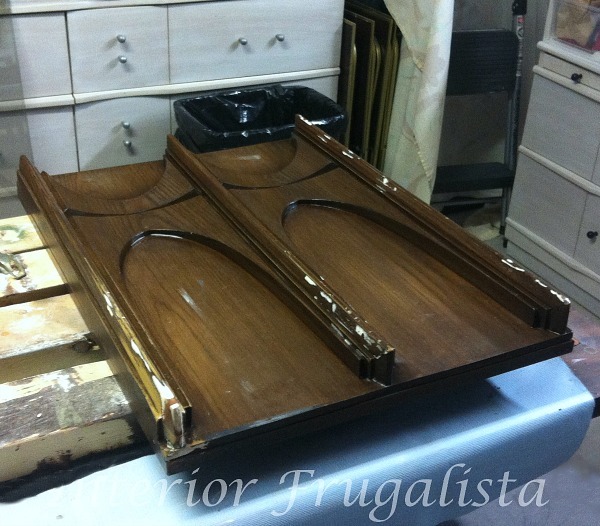 Apply E6000 glue onto both the trim and the furniture. Hold firmly in place to ensure a good bond (the glue takes about 2-minutes to get tacky. 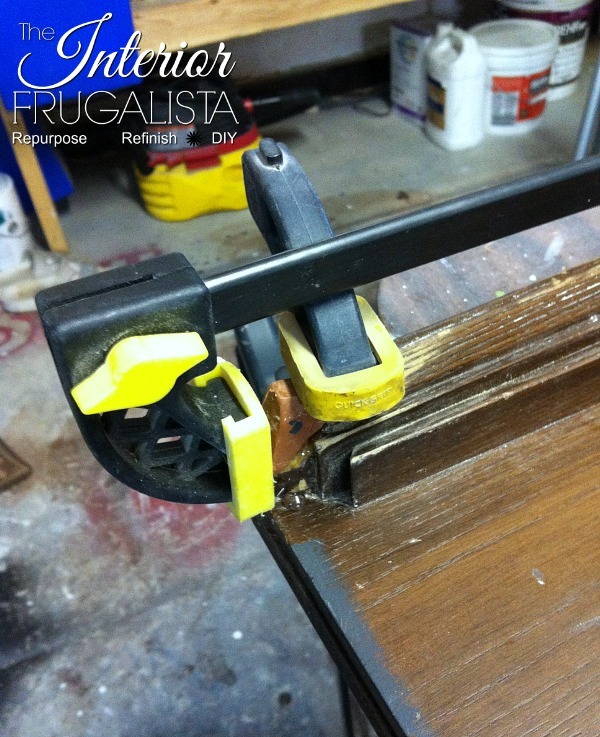 Once the glue is set (about 10-minutes) hold the trim in place with furniture clamps (as pictured below). Depending on the climate, it can take anywhere between 24-72 hours for the glue to completely cure. Wait for at least 24-hours before removing the clamps and moving onto the next step. Fill any gaps with filler, using your finger to smooth it out. 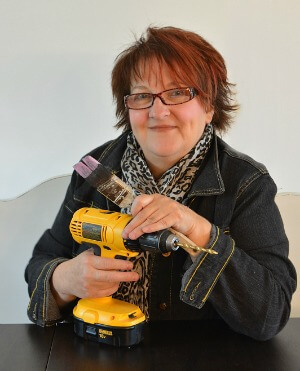 My personal preference is non-shrinking Dynamic Dyna Patch filler but you could also use a non-shrinking paintable caulk or wood filler. 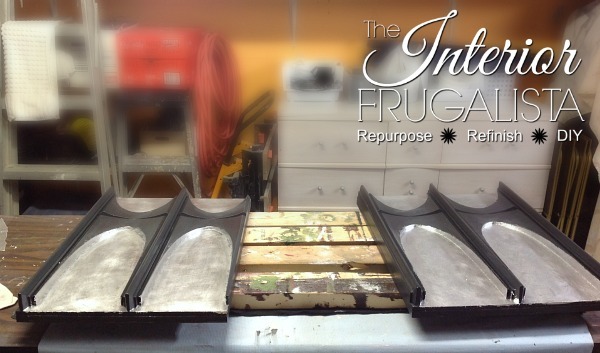 Once dry, smooth out any imperfections with fine grit sandpaper. I used a mouse sander to carve the trim for a perfect match to the original on the opposite side. Once the doors are painted, you will never know it was missing a chunk of trim. The raised panels on the doors were chalk painted in the color Graphite. Can you tell which door had the missing trim? 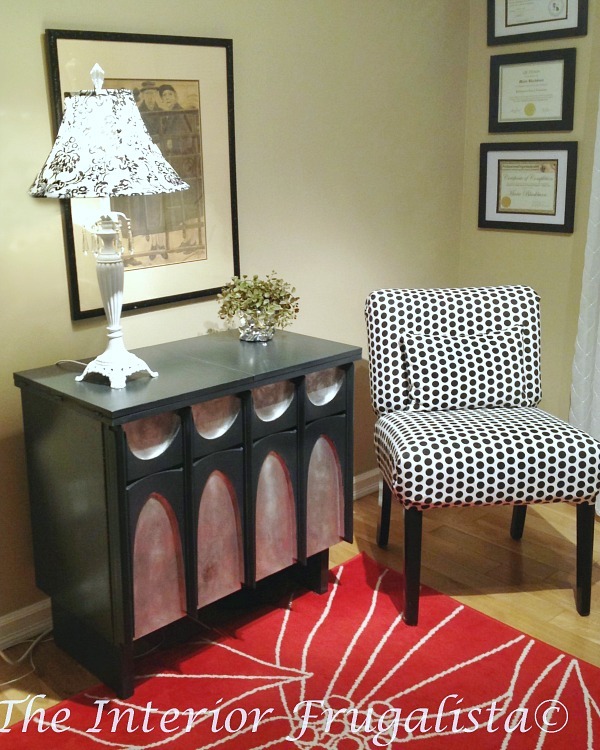 The sewing cabinet was also painted with two coats of Annie Sloan Chalk Paint™ in the color Graphite. Normally I protect chalk paint with clear wax but because this sewing cabinet will be getting a lot of abuse use, I opted to protect it with three coats of Minwax matte polyacrylic. See, that wasn't too difficult, was it? 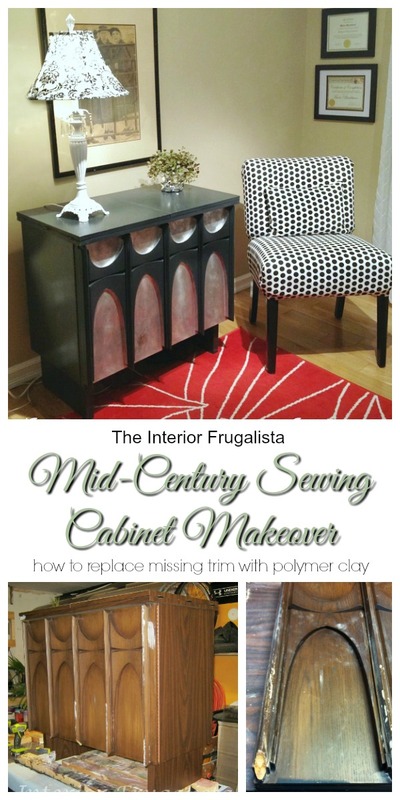 Having read this tutorial on how to replicate missing trim (or carvings and appliques), would you consider using polymer baking clay to repair furniture? 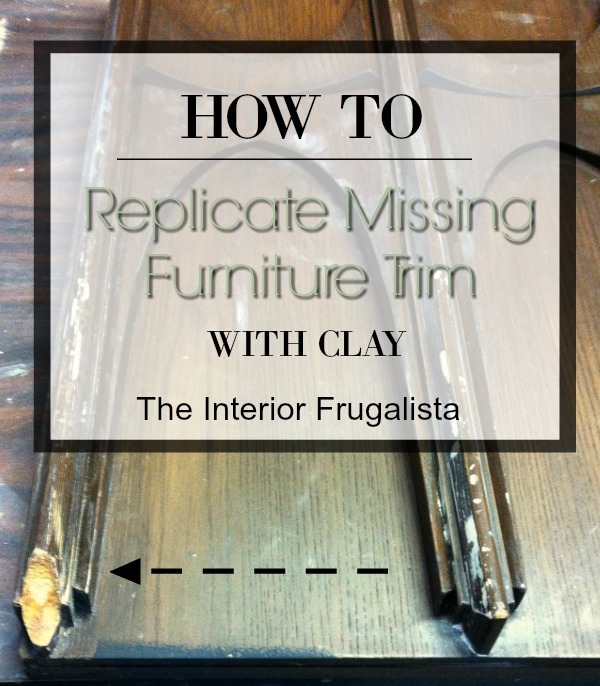 If you're a furniture rescuer like me, you may want to pin this tutorial to save should the opportunity to give this a try present itself. Rather than use metallic paint, I decided to try my hand at silver leafing. It was surprisingly easy and I quite enjoyed the process. I will write a full tutorial on how to silver leaf in an upcoming post but for now here is a helpful tip should you want to give it a try. The easiest way to pick up the sheets of silver leaf is by overlaying a piece of wax paper onto the sheet while it's still in the book. It sticks to the wax paper as you flip it upside down onto the tacky sized surface. Deciding the patina was a little too shiny, I burnished the silver leaf using very fine Grade #0000 steel wool in a circular motion. You can see the difference between the shiny silver leaf on the right and the burnished on the left. Once happy with the results, I applied a coat of silver leaf sealer. Hard to tell by looking at the finished Mid Century Modern Sewing Cabinet that there was ever a missing piece of trim. Looking at the before and after photo, I'm quite pleased with the results of this makeover and the sewing cabinet looks great in our spare bedroom a.k.a. sewing/craft/grandson's sleepover nursery. 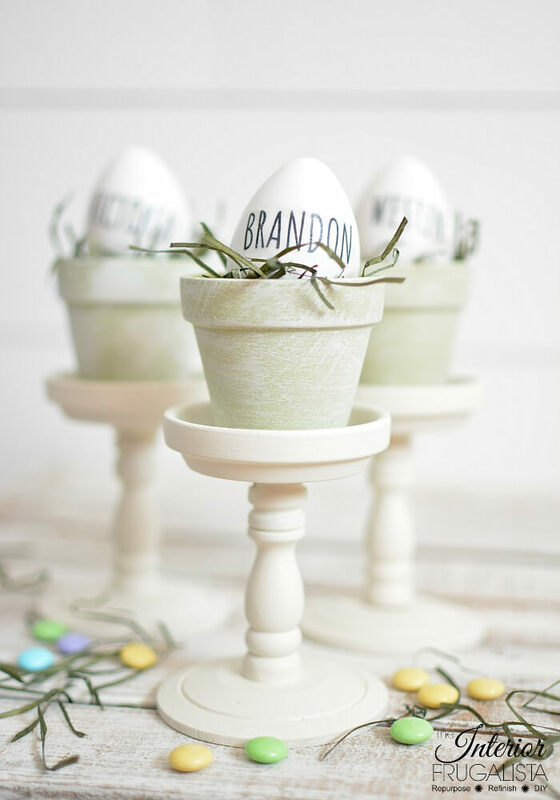 You will find this project linked up to these fabulous PARTIES.